I have about 5 sets of forms to be filled up by the user, one by one. Most of the fields in these set of forms are mandatory so it is obvious that the user has to check out all these 5 forms. Now I need your tips and guidance on what is the best approach to make this form less annoying. Consider this as an e-mail designer console where you keep editing the form on the left and you get a live preview over the right. 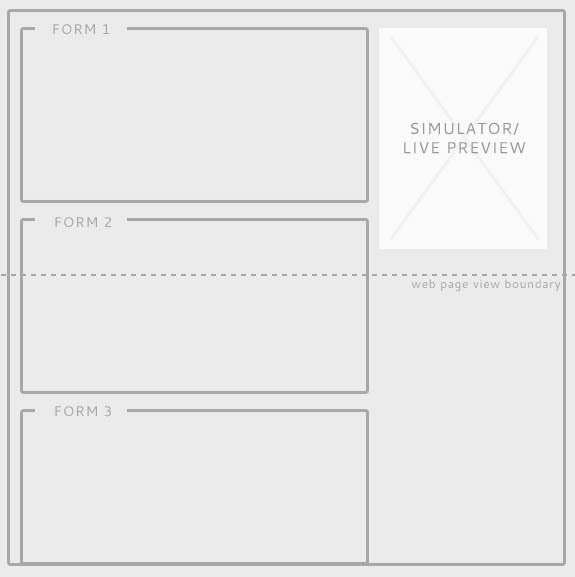 Now I have put these forms in an accordion menu format. Only one form is visible at a time and others are folded-in. The web page has no scroll bars, everything is crystal clear and user knows what's next. The user has a next button at the end of each individual form. This would show him the next form in the next accordion menu when it opens up. I feel this approach is good since I would also implement individual form validation, thereby reducing the pain in validating the entire form at the end. 3. Much Simplified, More Space. So this approach is some what similar to second but no accordion. Its just one form after another. But has a progress bar at the top allowing the user to navigate forms through it. I like this approach because it has much space for the form contents. In the previous type the according head was taking some vertical spaces so this minimizes it. I would suggest option 3. While 2 and 3 are close, the process indicator at the top of 3 is much clean/less distracting IMHO. The user has context to how far along they are in the overall process and should be able to intuitively click back and forth using the step indicator at the top of the page. Three gives users a strong sense of what's going to be required, how much more time they're going to have to spend, and a feeling for how the system is 'modelled'. It also lets them guess what answers are relevant for ambiguous questions in the current page by excluding information that will obviously be covered in later pages. Two also provides these benefits, but with increased 'noise' thanks to the accordion control. With Three, users are also going to be less likely to try and progress in a non-linear fashion, because the progress bar communicates a linear order slightly better than the collapsing divs. Not the answer you're looking for? Browse other questions tagged website-design forms layout scrolling or ask your own question. What text to include on “Next” buttons?